A joint publication by Town House Books ( in Ireland) and Simon and Schuster ( UK). 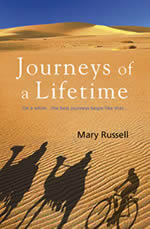 Lessons of life and death: an account of the many places visited by the author and what took her to them - the inner and the outer journey. This book came about after I was invited by travel writers Sara Wheeler and Dea Birkett, to contribute to Amazonian, a collection of new travel writing by women. Trawling through my travel diaries - I have 21 school exercise books going back to 1980 - I realised that I had enough material for a whole book. The title refers to the other journeys I was making in my life: twenty-two years of marriage to Ian which was a journey in itself, the arrival of our three children, an illicit love affair, Ian's journey towards death, the arrival of my first grandchild. While turning over in my mind the idea for Journeys, I started to analyse the way in which one destination leads to another often without the traveller necessarily being aware of the journey's genesis. To start at the beginning ( almost): in 1983 I enrolled in an Arabic language class because I had been to Sudan, had heard Arabic spoken there, was planning to go to the West Bank and wanted to learn more. My teacher was a Syrian whose love for his own language fell on my shoulders like stardust. I was learning not only a language but a lot about Arab culture. I was not to know that nearly twenty years later, I would wash up in Damascus and find that I had lost none of my old love of Arabic. As the Arabs themselves would say, it was written. And there's more. An American friend in Dublin, aware of my obsession with the Arab world, found in a Dublin Oxfam shop, an Islamic prayer-mat complete with Mecca-orientated compass. When I recounted this to my former Arabic teacher, now Professor of Comparative Literature, he smiled: " You were meant to have it," he said. Of course, rationally, he's all wrong but you have to wonder. As JG Ballard has written somewhere: " There are no coincidences, only deep assignations in our lives."